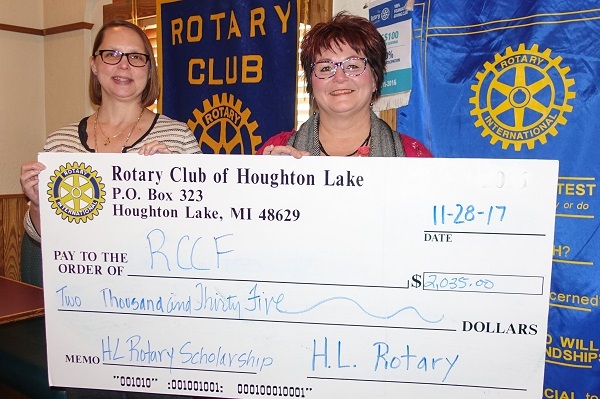 The Rotary Club of Houghton Lake recently made a Giving Tuesday pledge to match $1,000 in donations to the Houghton Lake Rotary Memorial Scholarship fund. The club received $1,035.00 in donations and presented Roscommon County Community Foundation Director Suzanne Luck a check for $2,035.00. The Houghton Lake Rotary Club Memorial Scholarship Fund was created to honor of Houghton Lake Rotarians who passed-away while active members, including founding member and past president John MacKenzie (2004), past president Russ Graham (2004), and past president and District 6290 Governor Robert Gandolfi (2014). John, Russ, and Bob exemplified the Rotary motto ‘Service Above Self’. The permanent scholarship fund memorializes their commitment to community by helping Houghton Lake High School students pursue higher education and fulfill their potential. Donations to the Houghton Lake Rotary Club Memorial Scholarship Fund are encouraged and can be sent to the Roscommon County Community Foundation at P.O. Box 824, Roscommon, MI 48653, online at www.MyRCCF.org, or by contacting Executive Director Suzanne E. Luck at (989) 275-3112. 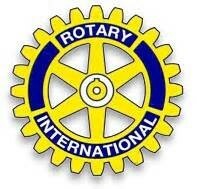 For more information about the Rotary Club of Houghton Lake visit www.HLRotary.org online or on Facebook at @HLRotary. Pictured is RCCF Executive Director Suzanne Luck and Rotary Club of Houghton Lake President Denise Stefanko.